TORONTO - Canada is contributing an additional $30 million for the international Ebola containment effort, Federal Health Minister Rona Ambrose said Friday. The announcement comes the day after UN Secretary General Ban Ki-moon called for additional funding, saying a trust fund the UN opened to finance the Ebola effort only has $100,000 in it. The UN has estimated it will need $1 billion to contain the West African outbreak. Ambrose said Canada's latest contribution was a response to Ban's call — though the CBC reported that the new Canadian funding announcement would be forthcoming before the secretary general issued the plea for additional contributions. "As the number of new cases continues to rise, it is obvious that more needs to be done to combat and contain the disease and to ensure that Canadians remain well protected at home," Ambrose said during a news conference in Toronto. "We also need to stand in solidarity with the people of West Africa... and we need to ensure that all of our global efforts are yielding results." The new money from Canada will be divided among a number UN agencies and international programs involved in the Ebola response. Recipients will be the World Health Organization, the International Federation of the Red Cross and Red Crescent Societies, the World Food Program, UNICEF and the UN Mission for Ebola Emergency Response. Ambrose said the Canadian funding will finance efforts aimed at stopping the outbreak, treating those infected, ensuring the availability of vaccines and services, preserving stability and preventing outbreaks in countries surrounding the three where Ebola transmission rages. She said the country would continue to explore possibilities for additional contributions to the response. 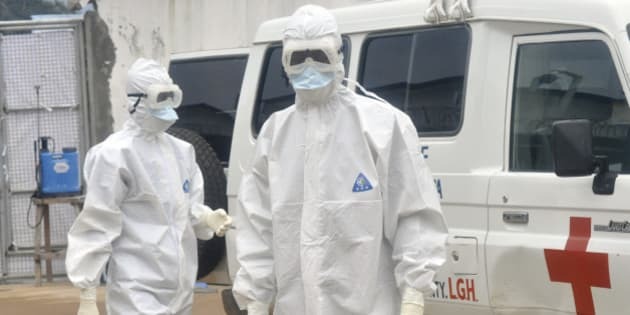 Dr. Gregory Taylor, head of the Public Health Agency of Canada, said two shipments of face shields — requested by the WHO — have been flown to West Africa. And more donations of the protective gear worn by medical response workers will be shipped in the coming weeks, he said. Canada has contributed $2.5 million in so called PPE — personal protective equipment. Canada earlier donated $35 million and has two mobile labs — and the teams to run them — in Sierra Leone. One team is running a diagnostic service for an Ebola treatment unit while the other is working with Medecins Sans Frontieres to try to determine why health-care workers continue to get infected in this outbreak. The WHO said Friday that to date 423 health-care workers have been infected with Ebola and 239 have died. Total numbers of known cases and deaths are 9,216 and 4,555 respective. Canada has also donated to the WHO between 800 and 1,000 vials of an experimental Ebola vaccine designed by scientists at the National Microbiology Laboratory in Winnipeg. Late last week the WHO said it was finalizing the legal agreements to take possession of the vaccine and have it shipped to Geneva. But Taylor said the vaccine is still in Winnipeg — though he suggested the agreements may soon be completed. Ambrose was asked if Canada would consider banning travellers from affected West African countries from entering Canada. She said Canada has no direct flights from the three countries and only 30 and 50 travellers a week travel from those countries to Canada. Still, she did not dismiss the idea. "What I will tell you is that we're not ruling out any options at this time." The WHO has asked countries not to ban travel from the affected countries, though a number of airlines have stopped operating flights into Guinea, Sierra Leone and Liberia. The WHO and other aid groups have complained the reduction in flights is making it harder for relief agencies to move people and materials into the region.